2016 is off to another hot start. The market is on pace to once again to be the most active year since 2005. MLS data shows 171 properties have sold in the 1st quarter totaling $34,885,255 vs 165 sales totaling $28,002,850 for the 1st quarter of 2015. If 2016 sees more sales than 2015, that will make 7-8 consecutive years the market has seen steady sales growth. The number of sales really started to climb in 2013 and this appears to be the 4th straight very strong year for the market. A great sign for the stability and long term strength of the market is that 88 out of the 171 sales this year have been reported as cash sales. This is by no means similar to the ’04 and ’05 market where people were speculating on investments with heavily leveraged purchases that led to a massive number of foreclosures and short sales. If you click the foreclosure tab above, you’ll see there’s only one foreclosed home on the market. Another sign of the current strength is that there are an additional 110 properties currently under contract. Price increases and the news of a hot market have lured some new sellers into the market, but we are finally seeing a decrease in inventory. There were an average of 725 properties on the market in 2013 and we are now down to 568. There’s still a fairly large selection of vacant lots overall, but we are down to just 213 homes from Mexico Beach to Cape San Blas. (For comparison, we had over 800 homes for sale in 2007 and about as many vacant lots). There are only a handful of homes in the average category and price range for buyers that I’m showing around these days. I’m hearing a number of complaints from buyers about the lack of choices left on the market. While this is bad for buyers, it’s good for rising values. The availability of vacant lots is keeping the residential construction market red hot. There are sub markets in each of the areas we cover with areas and types of properties doing better than others. I’ll describe some highlights below. In Mexico Beach, St Joe Beach, and WindMark Beach the hottest properties seeing the most appreciation are homes closest to the beach. Homes are certainly going up more than vacant lots. The condo market has also seen a nice boost in values over the last 3 years. Homes 3 to 4 blocks off are still selling, but they’ve seen quite a bit of competition, including from new spec homes. This is good news for buyers and they can get an interior home for as good of a deal or better than they could last year. There aren’t a ton of great values left, and we could see some nice appreciation this Summer once the best deals have sold. While the average home is up $57K since 2010, homes are still selling for less than 50% of their 2005 values. Many people feel it’s still a very good time to buy and this market segment has seen the most sales with 79. I’ve updated and here are links to my Top 25 Deals on Homes and Top 15 lots deals. 98 Real Estate Group continues to enjoy a strong market share in this market, and we are on pace to be the top producing company in this area for the 4th consecutive year. The Cape San Blas and Indian Pass markets have seen the largest recovery in regards to housing prices and also the most new homes built. You can see in the chart below that the average home is now selling for $170K more than the average in 2012. The North Cape remains hotter than anywhere from Mexico Beach to Indian Pass. The South End of The Cape and Indian Pass haven’t seen near the pickup in sales or values in comparison, but are seeing healthy increases, especially on beachfront homes. These markets along with the Mexico Beach Area are both supported by the strong vacation rental demand and income potential. I’d love a crystal ball right now to tell if the market can keep going up and how much further it will go. It seems every factor that helps the market is strong right now and pointing up. The number of new buyers finding this area and deciding to buy, low interest rates, rental demand, the overall economy, and inventory numbers point to prices continuing to increase. I don’t know how high it will go. I’m asked almost every day and give the best evaluations and facts that I can. Many people ask me if we’ll get back to peak ’05 prices and I don’t know the answer. We are still well below those values, and it could easily be 10 years or more. You can see below that the average home is still selling for less than half of what it did in 2005 in the Mexico Beach Area while home prices on Cape have seen a larger proportionate increase. The average lot is still selling for just 30 cents on the dollar from 2005 prices. I hope we continue to see a positive and healthy market with the majority of buyers buying for enjoyment vs speculation. There are a few big dips and rises in some of the stats below in regards to 2016. I’d ignore these and focus more on the yearly trends. One quarter isn’t enough time to get a true average and some of these swings are due to either a few high end sales or a number of the lowest priced properties selling. We were fortunate to purchase an office building that has over twice the amount of space as the office we were renting that was connected to Gulf Foods. We moved in January and love our new location. I welcome everyone to stop by at 101 S 33rd St in Mexico Beach. As the Cape market continues to remain red hot, we’ve also seen the need for an office on Cape San Blas. We are open for business next to the Trading Post at 143 Acklins Island Drive. 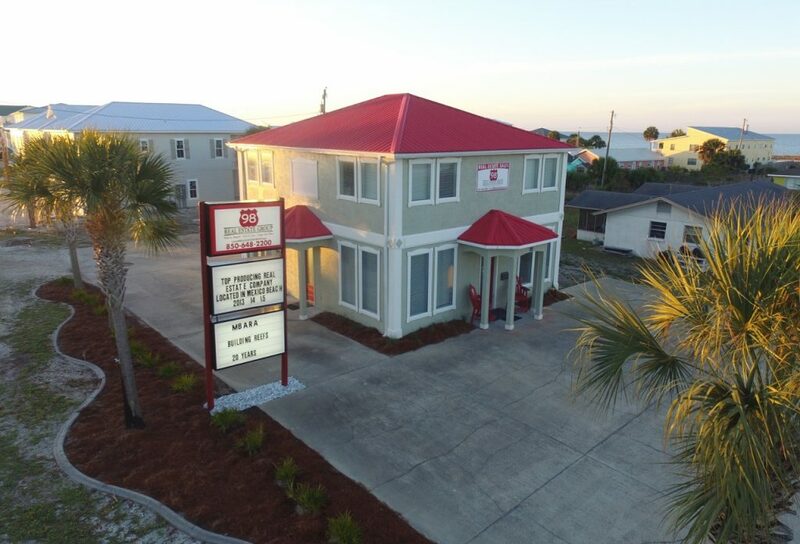 Below is a picture of our Mexico Beach office. Please let me know if I can help with any of your buying or selling needs.